Trading Spaces is sticking around. Today, TLC announced they’ve renewed the TV show for a 10th season. The home renovation show follows neighbors as they remake each other’s houses with the help of designers and carpenters. 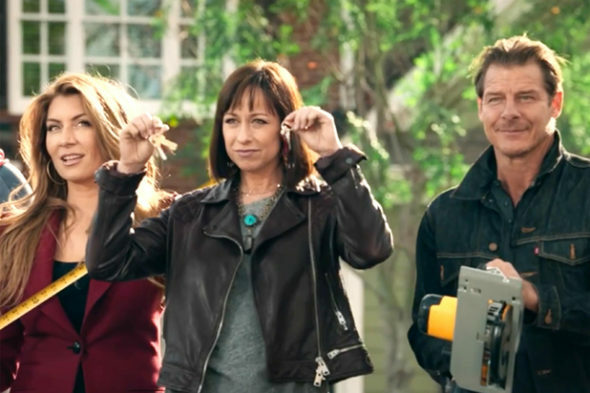 The series is hosted by Paige Davis and features designers Doug Wilson, Hildi Santo-Tomas, Laurie Smith, Frank Bielec, Genevieve Gorder, and Vern Yip. New designers include John Gidding, Kahi Lee, and Sabrina Soto. Production has just begun on season 10 of Trading Spaces. Host Paige Davis will return alongside designers Brett Tutor, Carter Oosterhouse, Doug Wilson, Frank Bielec, Genevieve Gorder, Hildi Santo Tomas, Joanie Sprague, John Gidding, Kahi Lee, Laurie Smith, Sabrina Soto, Ty Pennington and Vern Yip. (Los Angeles, CA) Find your smocks and grab your toolboxes DIY fans! After a successful return season, TRADING SPACES has started production on new episodes that will air in 2019. Join host Paige Davis as she keeps each team of homeowners, designers and carpenters on time and budget as they tackle their greatest makeovers yet. Returning for the new season are Brett Tutor, Carter Oosterhouse, Doug Wilson, Frank Bielec, Genevieve Gorder, Hildi Santo Tomas, Joanie Sprague, John Gidding, Kahi Lee, Laurie Smith, Sabrina Soto, Ty Pennington and Vern Yip, as they put their creative minds to work for bigger challenges and more design fun. TRADING SPACES was the first home makeover series of its kind and launched a generation of shows to follow in the television home design genre. Two sets of neighbors trade rooms for two days and, with the help of a designer and carpenter, makeover a room with a budget of $2000. The TLC GO Original Series Trading Spaces: Training Spaces will also return in 2019. This season, new designers will learn from and compete for the chance to be a design assistant for designer Frank Bielec. Binge the first season now on TLC.com/TrainingSpaces. Join the conversation on social media by using the hashtag #TradingSpaces, ‘Like’ the Trading Spaces Facebook page, and watch more video onTLC.com/TradingSpaces. What do you think? Have you seen the Trading Spaces revival? Will you watch season 10? More about: TLC TV shows: canceled or renewed?, Trading Spaces, Trading Spaces: canceled or renewed? I was so excited when Trading Spaces came back! And, can’t wait till it returns in 2019! Bring back that hottie Alex who hosted the first season. Love trading spaces why aren’t we watching the retuns till it start back!! !